The University of the Philippines College of Fine Arts (UPCFA) is the oldest arts and design educational institution in the country. In 2008, the CFA celebrated its centennial. Its history can be traced back to the early 19th century, when the country's first art school, the Academia de Dibujo y Pintura, was founded on October 8, 1823 by Damian Domingo in Binondo, Manila with the help of the Sociedades Económicas de Amigos del Pais (Economic Society of Friends of the Country). It was closed in 1834 but was reopened by the Spanish government eleven years later in 1845 with the support of Queen Isabela II. The second Academia brought over Spanish art professors who introduced European Classical traditions in art-making. It produced artists such as Simon Flores, who won a silver medal at the Philadelphia Universal Exposition of 1876—the first Filipino of native blood to win a prize from an international exhibition—and Juan Luna, whose Spoliarium won a gold medal at the Madrid Exposition of Fine Arts in 1884. In 1891, the Academia became the Escuela Superior de Pintura, Escultura y Grabado. In 1908, the Philippine Assembly under the American colonial administration enacted Act No. 1870, establishing the University of the Philippines. The existing School of Fine Arts became one of UP's three original founding units, along with the Philippine General Hospital and the College of Agriculture. For more than a century now, the UP College of Fine Arts remains steadfast in its vision to be the eminent learning institution for arts and design, imbued with a deep sense of humanity that inspires the Filipino to strive for excellece. The UPCFA commits itself to the task of nurturing career artists dedicated to the perfection of their craft and the enrichment of Philippine society. 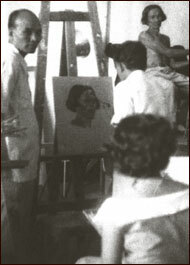 The institution has so far produced ten National Artists for Visual Arts, the highest state distinction given to Filipino artists: Fernando Amorsolo, Guillermo Tolentino, Carlos Francisco, Napoleon Abueva, Vicente Manansala, Cesar Legaspi, José Joya Jr., Abdulmari Imao, Benedicto Cabrera, and Federico Alcuaz. The history of the school runs parallel not only to the history of the UP, but also to the history of the development of Philippine art and art education in the country.